"Yoga teaches you how to listen to your body." These are words every practicing yogi knows to be true. "I have a background in wellness, as well as mental health counseling, and I thought, ‘you know what people need?' We need some kind of self-care program," Hockman said. "I thought, from a wellness perspective, let's just promote health, prevent disease and let's just offer tools for self-care." "I noticed a flyer offering free yoga classes in my building and reached out to the JSS," said Stewart. "I asked if they needed other people to help teach and we established another day to teach yoga. We keep it very basic, very intermediate, since a lot of people who come have never done yoga before." Veterans Yoga Project is an educational and advocacy organization dedicated to improving the health and wellbeing of military veterans. They offer opportunities for intensive training in a proven, mindful approach to teaching yoga to veterans and their families. "When we get distressed, our breath gets shallow, so if I can slow down and breathe, it's good," said Yslas. "The movement speaks for itself, when you get the movement in concert with breathing you really begin to see what happens; people who have suffered trauma sometimes feel as though their body has betrayed them in some way, and so we're trying to get people to feel the present moment/movement sensation." Hockman has been incorporating several different approaches to wellness through the JSS. They're currently getting ready for their "Tools to help you thrive" workshop Jan. 30. 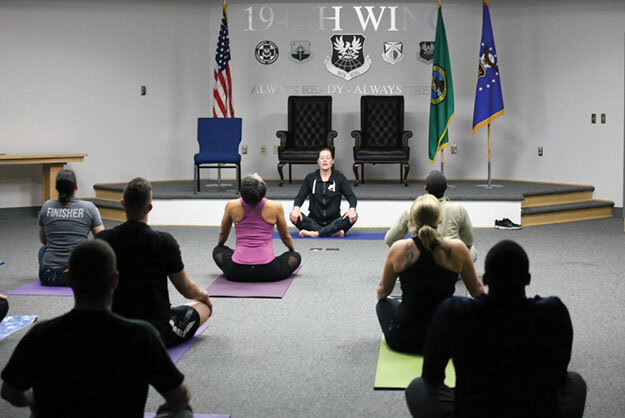 If you would like to check out a yoga class, Jaime teaches every Tuesday at the Pierce County Readiness Center, or Master Sgt. Samantha Stewart's class Wednesdays at the 194th Wing Auditorium Building 109. Both classes are at 11:15 a.m.